Using Blue Weber Agave of a much older age than most – especially for a Lowland where the average age seems to be 3-5 years at most – they use 8 to 12 year old agave. This gives an agave plant more time to mature and develop a sense of terroir and nuance, which is clearly discernable in the finished product. Appearance: Crystal clear, lovely body. On swirling, it leaves a very light coating on the glass which then forms some legs which then leave a constellation of droplets on the sides of the nosing glass. 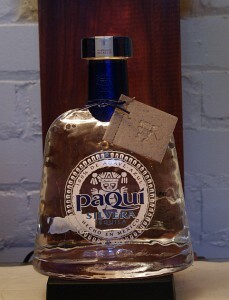 First Impression: Has a unmistakable aromatic hallmarks of a good lowland tequila: Fruity, sweet brine, savory, citrusy . Taste: Wonderful glycerin / saplike body. Sweetish entry drying rapidly but pleasantly. Savory, orange, citrus and pepper. Some mineral notes with spice and citrus. Finishes a touch dry with savory, citrusy ending, medium-long, very smooth. Drinks: Actually not bad on its own- sip it don’t shoot it. One of the few silver tequilas you can drink straight without wincing. Makes for a wonderful margarita, so as with any excellent tequila be sure to use fresh juice and Grand Marnier or Cointreau- anything less would be an insult to the tequila and a waste. Also the lovely fruitiness makes for a more complex and multilayered group of flavors in any drinks calling for a tequila – and the price doesn’t break the bank. Cigars: An Ashton, or Credo, Connecticut shade wrapper. Bottle: Short shaped clear glass bottle with rounded shoulders short neck and blue neckband. Embossed/pressed design gives it a look like hammered silver in texture bottling date and batch # on back. Composite cork (with large wooden top with metal medallion) reduces chance of cork taint. Frankly, I liked the old look better. Final Thoughts: Very nicely done, especially since this is a Lowland tequila. I have a personal preference for Highland tequilas usually- but this one is quite outstanding. While they do use some no traditional methods (such as shredding and rolling the agave – they do use superior agave to begin with and a deft hand at making the proper cuts in the distillation to make a excellent product. This coupled with the low price given the quality paQuí should make a number of other, more well known brands, lose some sleep. Somewhat terse or brief information. Could have more facts and pictures.Well-laid out.